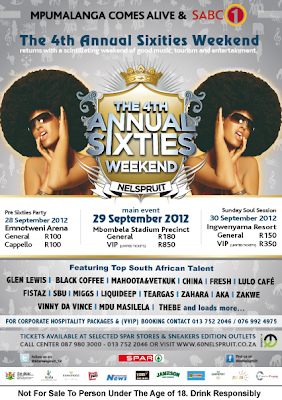 A festival of urban and soulful sounds is set to bring a dynamic vibe to Nelspruit yet again this year, Mpumalanga will come alive this September as the 4th installment of Annual 60s Weekend returns with a scintillating weekend of good music, tourism and entertainment. The event attracts a mélange of ethnicities from across the country, young and old for this exciting and progressive city. For the past 3 years these events played host to a unique melting pot of these cultures, coming together for a massive celebration. Boasting some of the majestic and panoramic views, the Mpumalanga Province will come alive from 27th – 30th September 2012 when revelers and tourists from all over Sub Saharan South Africa gather at some of Mpumalanga’s iconic locations, such as Mbombela Stadium, Emnotweni Arena and Ingwenyama Conference and Sport Resort. 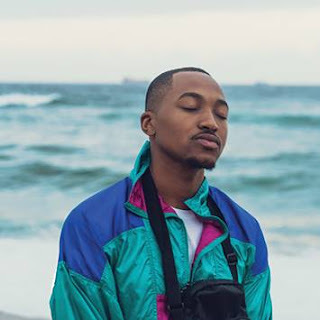 “We are quite thrilled at the success the festival has enjoyed over the past three years and this year is going to be even better as we feature the SAMA awards Winners and the Musical Legends such as Thebe, Mdu Masilela to head our strong line-up of more than 40 Artists,” says Sam Sekgota, Marketing and Operations Director of Molite Productions. The 60s Weekend in Nelspruit will kick off with a new edition which is a comedy show on the Thursday, 27th September at the News Café and on Friday, 28th September will be the high-energy Pre Party at Emnotweni Arena featuring some of the top club DJs in the country. Saturday, 29th September will be the Main Sixties Party at Mbombela Stadium and on Sunday, 30th September the weekend winds down at the Ingwenyama Lodge with sultry and soulful sounds at the popular Sunday Soul Session presented by the METRO FM’s Paul Mtirara, Sweetmike and Eddie Zondi headlined by top Jazz Artist Zahara and Jaziel Brothers flanked by local artists Tsepe, NuError and many more. “It sure is going to be an unforgettable Mpumalanga weekend and we urge all South Africans to set aside that September weekend and book their tickets, flights and accommodation as this is going to be a memorable festival of excellent music,” adds Sekgota. Line-Up: Chris Mapane (Host) | Tshepo Mogale | Thomas Gumede | Ntosh Madlingozi |Thapelo Tips (Shampoo) | Tsietsi Matlakala | Ma Anda | Mfundo Khumalo |Moozy Khumalo. Win tickets - WIN! WITH US & Aptitude PR - we wanna give you the access to all the fun! Run and do the following.